The number of System i™ customers running one or more Web applications is growing quickly. By integrating WebSphere Application Server - Express to i5/OS®, IBM® opens a door to a world of Web applications for all System i customers. Establishing solid knowledge and best practices in installing, administering, and maintaining WebSphere Application Server becomes one of the most important tasks for the System i administrators and support personnel. 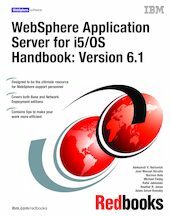 In this IBM Redbooks® publication, we explore the latest WebSphere Application Server version to date, Version 6.1. We include instructions for performing numerous tasks around WebSphere Application Server for i5/OS: installing the product, working with the server and applications, tuning the performance, setting up security, and more. We strongly recommend this book for any technical professional who works with WebSphere Application Server. We designed this publication to help system architects, WebSphere® administrators, and software developers.